I’ve just begun outlining my fourth novel. No-one is more surprised at reading those words than I am! Obviously, I’m still in the honeymoon period, meeting the characters, sussing out locations. There’s nothing like starting back at the beginning to remind you how delicate this process is and how, at one point, writing more than one book seemed like wishful thinking. They say that everyone has a book in them, but the greatest fear of all writers is that one book is the limit. What if that’s all there is? I remember when I published my debut novel, the thought of writing another book was almost laughable! Do that again? Are you nuts?? The idea for that book came to me somewhere around 2010 – but that’s not really the beginning of the story. 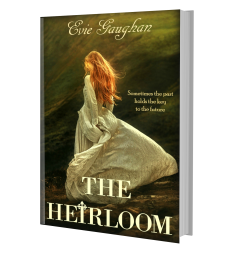 I began writing The Heirloom after a two-year break from writing, following the disappointment of my ‘actual’ first novel, unfortunately titled ‘Shoot The Moon’. I missed. My ideal publisher requested the full manuscript. 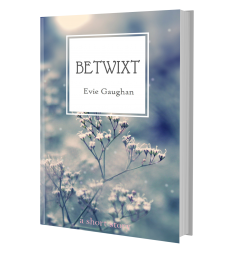 It was too good to be true – I hadn’t even finished writing it (rookie mistake number one) and now I had a major Irish publishing house interested. When the letter came back, praising my writing but accurately pointing out that the story wasn’t strong enough, I went into a kind of mourning. One rejection letter of my first and only (and unfinished) novel was enough for me to scrap the entire enterprise. When you start out as a writer, your ego can be so fragile that even when positive feedback arrives along with an initial rejection, it comes as a huge blow. Over time however, my bruised ego healed and I began reading more and beyond the limited genres I felt comfortable with. I discovered time-slip (or dual timelines) and just fell in love with the idea of connecting the past with the present. So, my writing was good but my story wasn’t strong enough, eh? Well, I was going to give them a story to knock their socks off! I spent over two years researching and writing a monster of a novel, with a story stretching from medieval Ireland to the present day. It took over my life and at times (i.e. all the time) I felt as though I had bitten off more than I could chew, but when I eventually self-published The Heirloom, I felt a huge sense of achievement. For about a week. And then people started asking if I was working on my next book. I thought I’d misheard them. ‘But look,’ I’d say, ‘look at the big huge book I wrote. It took two years and it nearly killed me. Isn’t it brilliant? Won’t I be living off this success for years? !’ Tumbleweed rolled by as my audience backed away. Turns out readers need proof that you’re not a one-trick-pony (bloody readers). If they like book one, they need book two to satiate their appetite, or they’ll have to look elsewhere. All of this is like a threat hanging over an author’s head! Like a lover threatening to leave if you don’t keep them… entertained. Not a great motivation for writing, but motivation nonetheless. I quickly realised that if I wanted to stay in this business, I had to write more than one book – hardly rocket science, but still it came as a shock! This was officially my second book, did I really have a third in me? But just when I wasn’t looking, the plot for my next novel dropped into my lap. I was watching a TV show about an Irish chef living in France and for some reason she decided to visit a renowned bakery that was shrouded in secrecy, as no-one knew who the baker was. I may have made that last bit up; it’s all so long ago that I’m not sure where the TV show ended and my imagination began. 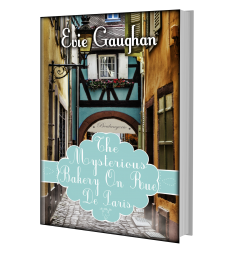 Either way, the ingredients for The Mysterious Bakery On Rue De Paris were gathered and I began writing again. Just recently while doing a clean up of old files on my computer, I found the first draft, in which I hit the mother of all dead ends. I had forgotten that, but my original plan for the story just didn’t work. I thought, that’s it, I can’t write. I remember now, laughing slightly hysterically with my sister about it, who assured me that I would get there in the end. But how could she know that? I didn’t even know it! As an observer of my writing process, all she saw was another speed bump, not a dead end. I can’t say exactly how long it took me to work out another route, but one day my main character Edith appeared in my head and took over the story. I started having fun again and realised that my first attempt was too serious. I was trying too hard to be a writer instead of telling a good story and enjoying myself on the page. Writing never really gets any ‘easier’, but I suppose what does change is your faith in the process. Practice does actually make perfect and what’s more, it builds confidence. Somewhere in your neural pathways is the memory that you have done this before and therefore, can do it again. Whether you are traditionally published or self-published, there are pressures to get more books out there as quickly as possible, but I’m not sure if this is a good thing for writers. I remember getting the advice that you should have three novels written before you begin publishing and thinking, who are these people?! I don’t think I would have been able to write another novel if I hadn’t seen that there was an audience for my work. Also, I am a firm believer in giving your ideas time to germinate. I see a lot of commercially successful authors who have a new novel out every year for a decade and I wonder, where do they carve out the time to just, think? Maybe it’s a luxury, but one of my favourite things is turning an idea over in my mind for months at a time, watching it take shape and expand. This is the time when serendipity peeps out from behind corners, magazine articles, overheard conversations; drawing all manner of flotsam to the shores of your mind, that just happen to fit your story. If your goal is to sell a lot of books, then yes, by all means write a trilogy and study the genres that are popular right now (it’s grip lit by the way, you can have that for free!). But if your goal is to be a writer and to write the kind of stories you love, that say something about you, don’t rush. You have to make the choice between what’s right and what’s easy. I read an interview recently with Irish author John Boyne who said he always advises his students against taking the easy route and ‘brushing up’ old manuscripts, for lack of any better ideas. This may have been a cheeky reference to some of his fellow authors, but I get his point. Sometimes the thought of starting out from scratch again is so scary and the pressure to produce a new novel so great, that the temptation is to cut corners. But it’s your integrity that’s on the line – your unspoken contract with the reader. Like I said, it doesn’t get any easier, your ego is still open to bribery. I wish there was a lovely motivational quote I could use to send you all merrily on your way, but you know the answer and it’s not very glamourous. The only way to write your next book is sit down and write. And believe. And in my case, surround yourself with four different types of chocolate. And stop looking at Twitter! I need all of that advice, I’m only just starting out with novel number one and I can’t imagine getting to the end of it at this point – major speed hump called LIFE! I am seriously lacking in discipline and chocolate. I couldn’t agree more about taking as much time as it takes to write a novel, Evie. My debut one for adults took about 14 years (I was dipping in and out – I wasn’t working on it non-stop for all of that time!). I’m hoping the second will be a slightly faster process!! In solid and liquid form! Thanks for sharing your writing and publishing journey. I think you have accurately expressed a lot of common writers’ fears and worries about producing follow up books. I am working on my second novel so I relate to what you say about that feeling of pressure. But it’s also such a great opportunity to learn from and build on your previous work! Hi Claire, good to meet you. Completely agree with you about building on previous work. I cannot overstate the amount I have learned about myself and my craft with each new book. It makes you realise that with every passing year, the books we read, the experiences we have, the maturity we (hopefully) gain, all serve to influence our writing. Thanks for stopping by! Thanks Evie, this really encourages me and fills me with hope that I can improve over time! With novel one dropping in July, this has been a timely read. Writing it came with no deadlines, no expectations, and no restrictions (such as writing to an existing audience.) Not so with the second. And now I find any story ideas I’ve had seem to have flitted away. Waiting for that plot to land in my lap! Congratulations Jean and good luck with your debut 🙂 Hope this article has been a comfort – I think it’s the same for every writer. The first novel is such a unique experience and it’s impossible to try and recreate that (imo). Like I said, it doesn’t get any easier, but you learn so much from your first that you have to trust you are in an even better place now to write your second. Trust me! A fab and thought provoking read. I believe you have to write more than one to get to your debut novel. I am on book 3 and still no debut novel. With each book I learn something else about writing but don’t feel I am good enough yet to go for it. Had a few rejections but they are just part of the fun.